I finally managed to hit level 120 this week. I have not been making too much gold, as I am investing quite heavily for the raids, and I bought way too many medallions of the Legion. Most of this week was spent leveling, and then I started doing world quests for rep as soon as I hit 120. I have not yet unlocked any recipes, but I will keep at it. I’ve also started leveling both cooking and enchanting properly on my warrior so I am ready for raids. I’m not quite where I want to be there yet, but overall it’s at an OK level. I’ve realized that alchemy will be dominated by people with rank 3 potions, so I will have to level my DH as soon as possible. I think I will prioritize it between emissary quests to maximize my rep on my warrior. I sold my first BoE at a massive loss as well, so that sucked. I’ve been spending a LOT of gold though. Primarily on battle potions, I’m up to about 1 million worth of potions at the moment. My liquid gold went down quite a bit this week, mostly off the back of massive expenditures. 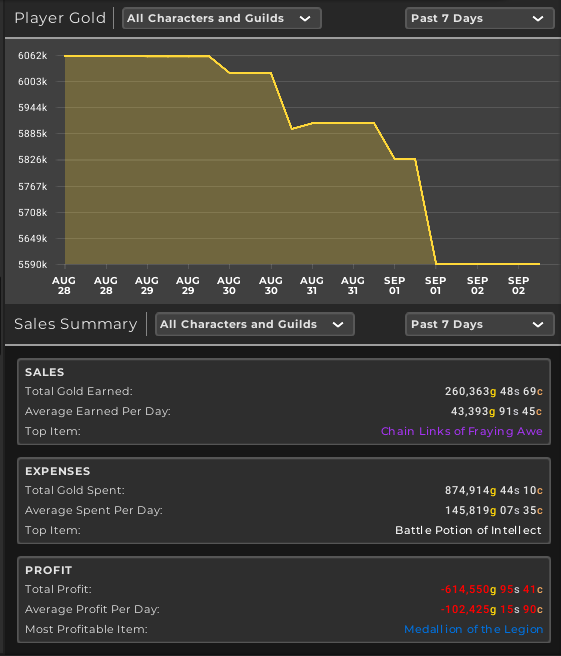 There’s also something wrong with TSM sales tracking as according to the in game statistics pane my sales this week should be in the 500k range. My sales this week are quite disappointing. 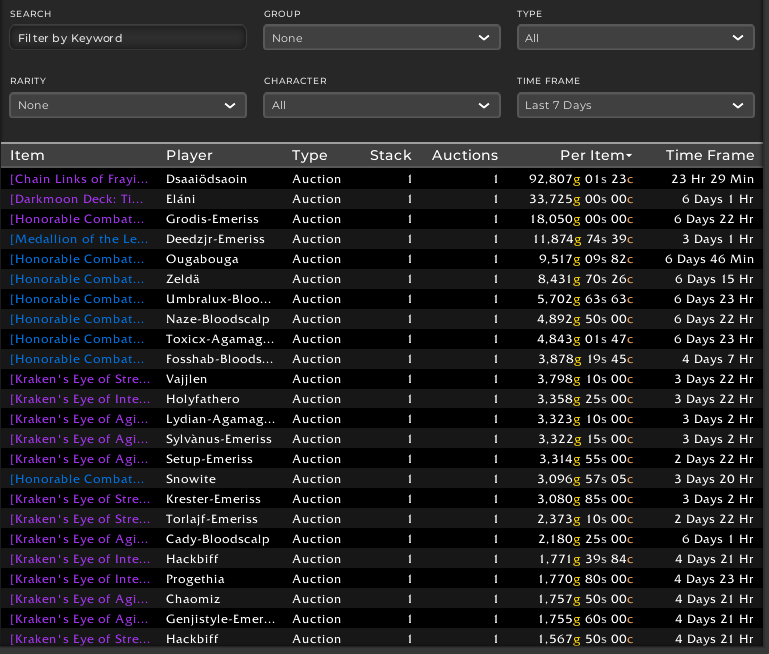 The ilvl 300 gear market has been very slow as you can see, with a very low number of sales. I’ve been selling Kraken’s eyes consistently, but nothing else. I haven’t really had time to craft Darkmoon decks or prospect more ore. Now that I’m 120 I can prioritize crafting a bit more, even though I still have a lot of stuff to do in terms of unlocking recipes and professions. At this point my time is definitely the most limited resource. 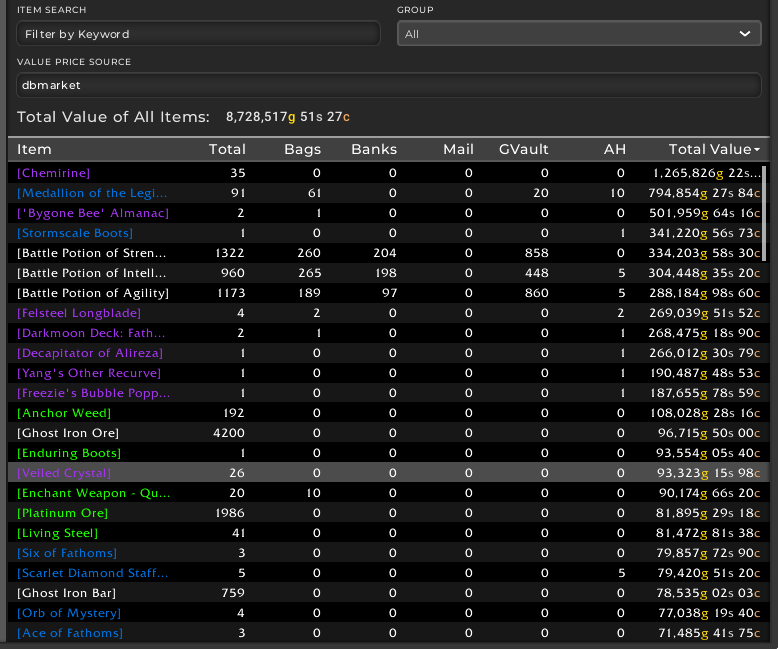 The TSM team has finally added the inventory view to TSM4. This is going to be great as we are in a time of great upheaval. The obvious entry on this list is of course all the battle potions. We can see that I am approaching 1000 of each type, with a current DBmarket of about 300 gold per. My average buying price is between 300 and 330 for the three potions. My new top value item is by far the Medallions of the Legion. I went on a massive shopping spree as they are so cheap at the moment. Sales are really slow, but I expect this is a good long term play. I loved your jewel crafting guide – thank you! My main is not JC and Engineer – my alt is about to hit 120, what would you recommend? I was thinking Inscription, and Tailoring?